Six train companies operate passenger service to and from Vancouver: Rocky Mountaineer, ViaRail, Amtrak, Vancouver SkyTrain, Translink’s Canada Line (between the airport and downtown) and West Coast Express. The Rocky Mountaineer offers service between Vancouver and the Canadian Rockies and between Whistler and Jasper National Park; ViaRail and Amtrak trains offer service to all major cities in Canada and the US; the Canada Line offers service between downtown Vancouver and the Vancouver International airport and the West Coast Express offers service between downtown Vancouver and the rest of the lower Mainland. The world famous Rocky Mountaineer Train runs trains between Vancouver and the Canadian Rockies (Banff and Jasper) and between Vancouver and Calgary from the middle of April to the middle of October. The Rocky Mountaineer travels between Vancouver and Seattle 12 times in each direction in 2017, always on a Saturday. The train trip between Vancouver and Seattle or Seattle and Vancouver can be added to any other Rocky Mountaineer trip. 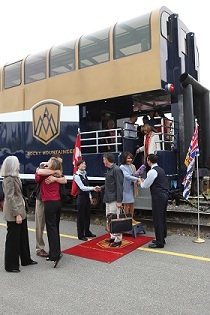 It is not possible to take the Rocky Mountaineer only between Vancouver and Seattle. The train leaves Vancouver for Seattle AND Seattle for Vancouver on Saturdays from May through September. This service is available to everyone, but is especially convenient for Seattle cruise ship passengers who want to combine an Alaska cruise with a Canadian Rockies train vacation. The two day Rocky Mountaineer train trip between Vancouver and the Rockies or Calgary is often packaged with hotel stays in Vancouver, Banff, Lake Louise, Jasper and Calgary and can include Glacier Helicopter tours and tours to Yoho National Park and the Columbia Icefield. Rocky Mountaineer trains travel only during the day so travelers miss none of the spectacular scenery. At night the train stops and guests spend the night at a hotel and then continue their journey the following day to their destination. Rocky Mountaineer passengers, almost without exception, consider their Rocky Mountaineer trip one of their most memorable travel experiences. For more information about Rocky Mountaineer train trips, see the Rocky Mountaineer Train pages, call us at 604-990-9299 or 800-913-9207 or email with questions and requests for more information. ViaRail, Canada’s national passenger railroad, offers year round train transportation between Vancouver and points east: Jasper, Edmonton, Winnipeg, Toronto, Montreal and Halifax. 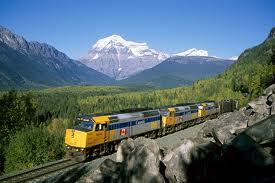 It also offers train service from Jasper to Prince George and Prince George to Prince Rupert. VIA Rail’s classic trains offer several types of sleeping accommodations, observation domes, lounges and an art-deco style dining car. Meals are included when you purchase sleeping accommodations on Via’s trains. Popular routes include the 17 hour trip between Vancouver and Jasper, a four day / three night trip between Vancouver and Toronto, a four day trip between Vancouver and Montreal, and a six day trip between Vancouver and Halifax, Nova Scotia. ViaRail trains depart Vancouver’s Pacific Central Station on Tuesday, Friday and Sunday evening at 8:30 PM. They arrive in Jasper the following afternoon at 4:00 PM. The ViaRail station is located at Pacific Central Station in downtown Vancouver at 1150 Station Street, near the corner of Main and Terminal Street. Pacific Central Station is half a block from the Main Street/Science World SkyTrain station where you can catch Vancouver’s light rail service to downtown Vancouver. Trips take about 3 minutes and cost about $3.50 for adults and $2.25 for children. You can also take a taxi downtown for about $10.00. For ViaRail train transportation and tour information, call 604-990-9299 or 800-913-9207. Amtrak offers passenger train travel between Vancouver and Seattle. This route is one of Amtrak’s most popular. There are two round trips each day. The price is $54 per person one way plus tax. Amtrak departs Vancouver each morning at 6:40 AM and arrives in Seattle at 10:55 AM. In the evening, Amtrak departs Vancouver at 5:45 PM and arrives in Seattle at 10:05 PM. The Amtrak train departs Seattle each morning at 7:40 AM from the Amtrak station at 303 S. Jackson Street and arrives in Vancouver at 11:35 AM at Vancouver’s Pacific Central Station, 1150 Station Street. In the evening, Amtrak leaves Seattle at 6:40 PM and arrives in Vancouver at 10:45 PM. The local Seattle Amtrak station number is 206-382-4125. Amtrak also offers one daily round trip between Vancouver and Portland. The train leaves Vancouver at 6:40 AM and arrives in Portland at 2:50 PM. 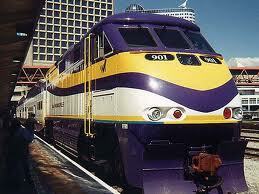 From Portland, the train departs at 2:50 PM and arrives in Vancouver at 10:45 PM. The Portland Amtrak station is located at 800 NW 6th Avenue. 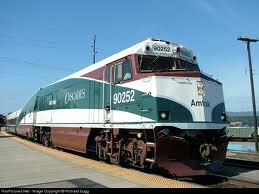 The local Portland Amtrak station phone number is 503-273-4866. Tickets are about $65 per person one way. En route, between Vancouver and Seattle, the train stops to pick up passengers at Edmonds, WA, Everett, WA, Mt Vernon-Burlington, WA and Bellingham, WA. Between Portland and Seattle, en route to Vancouver, the train stops at Vancouver, WA, Kelso/Longview, Centralia, Olympia, Tacoma and Tukwila. Contact Amtrak for more information: 1-800-872-7245. 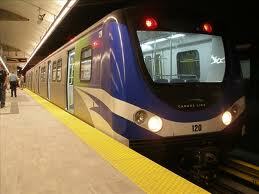 Vancouver’s Canada Line offers light rail service between downtown Vancouver and the airport. This great service operates daily from early morning to late at night. A one way train trip between the airport and the terminus at Waterfront Station takes 26 minutes and costs between $3.75 and $8.75 per person, depending on the time of day. Purchase tickets at the station. At the airport, the Canada Line station is located just outside the International Arrivals door. Once outside the airport, cross the street and take the elevator or escalator up to the third level. The West Coast Express operates five trains during weekday peak periods connecting Mission, Abbotsford Maple Ridge, Pitt Meadows, Port Coquitlam, Coquitlam and Port Moody with downtown Vancouver. Trains leave Vancouver from the Waterfront Terminal which is also the Sea Bus/SkyTrain terminal just east of Canada Place and the Cruise Ship dock.